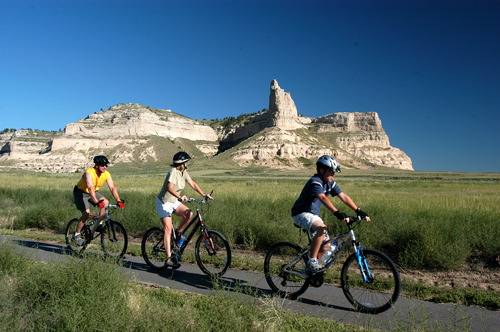 Experience new and different tours offered in Gering. Tour options include a walking dining tour of the downtown area, culinary coffee, tea and wine tasting, hands-on agriculture adventures and a Kodak moments tour. Our convenient location in Western Nebraska, equidistant from the Rockies in Denver, CO, and the faces in Rapid City, SD, make Gering the hub for all tourism amenities the area has to offer and ideal for overnight stops. If you have an hour, a half-day or longer….our Oregon Trail attractions, fine lodging and group friendly dining make us a great destination. We look forward to seeing you soon! Brochures and printed materials for your customers. Digital photography and information to help customers see your tour. Assistance in contacting receptive operators. Assistance in selecting accommodations and attractions for your tour. Sample itineraries; customized, themed and special interest. Personal welcome upon arrival, welcome packets for passengers. Contact the Gering CVB, and let’s start planning your tour today! If you're coming to Gering for work or leisure, stop into the Gering CVB. No matter what your interests, we can point you in the right direction and show you the hidden, and not so hidden, gems of our wonderful community.